γδ T cells and dendritic cells (DCs) participate in early phases of immune response against Mycobacterium tuberculosis. We investigated whether a close functional relationship exists between these two cell populations using an in vitro coculture in a human system. Vγ9Vδ2 T cells induce full maturation of M. tuberculosis-infected immature DCs, as demonstrated by upregulation of the costimulatory CD80, CD86, CD40, and HLA-DR molecules on infected DCs after 24 h of coculture. 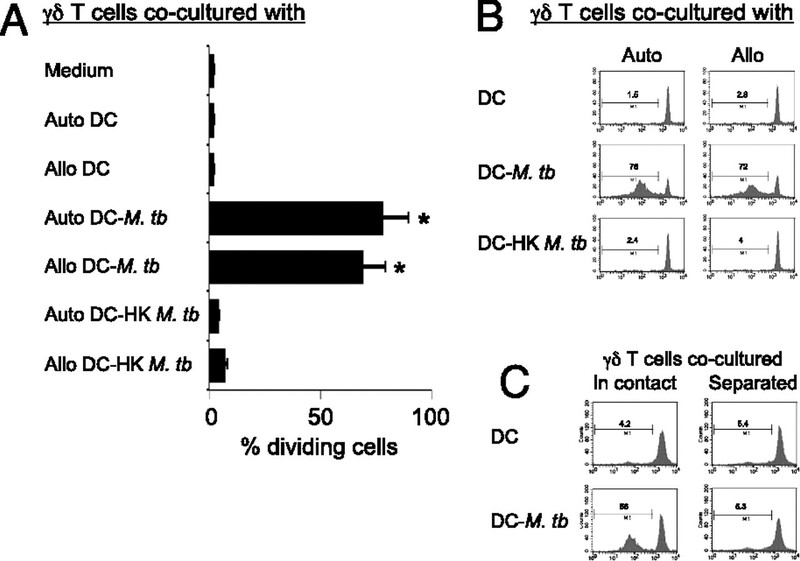 Reciprocally, infected DCs induced substantial activation of Vγ9Vδ2 T cells upon coculture, which was cell-to-cell contact and TCR dependent, as demonstrated in transwell experiments. However, infected DCs selectively induced proliferative, but not cytokine or cytolytic, responses of Vγ9Vδ2 T cells, and this was associated with the expansion of phenotypically immature, central memory-type Vγ9Vδ2 T cells. Importantly, expansion of central memory Vγ9Vδ2 T cells and reduction of the pool of Vγ9Vδ2 T cells with immediate effector functions (effector memory and terminally differentiated cells) were also detected in vivo in the peripheral blood of patients with active tuberculosis, which reversed after antimycobacterial therapy. M. tuberculosis-infected DCs produced many different cytokines, but not IL-15, and addition of IL-15 to cocultures of infected DCs and Vγ9Vδ2 T cells caused efficient differentiation of these latter with generation of effector memory and terminally differentiated cells, which were capable of reducing the viability of intracellular M. tuberculosis. Overall, this study provides a further piece of information on the complex relationship between important players of innate immunity during mycobacterial infection. Myeloid dendritic cells (DCs) comprise the major DC population and are found in blood, tissues, and lymph nodes; when pathogens such as Mycobacterium tuberculosis are recognized and sense the immature DC through the recognition of molecular patterns, this recognition induces DC maturation. Most stimuli originate from local microbes, inflamed tissue cells, innate leukocytes, and αβ T cells and induce DC maturation by engaging several receptors, including TLRs, C-type lectins, adhesion molecules, and receptors for cytokines and maturation factors. Many of these stimuli subvert the DC maturation, and in other cases, some are considered as potentially useful in immune response (1). Recent studies support the hypothesis that DCs also strengthen the cellular immune response against mycobacterial infection (2–6). Even if the critical role of DCs in the initiation of immune response has been established (7), their involvement in M. tuberculosis infection is poorly defined. DCs are highly represented in sites of M. tuberculosis infection at the onset of the inflammatory response (8–10), and immature DCs present in the lung mucosa are specialized for Ag uptake and processing. After interaction with pathogens, they mature and migrate in lymphoid organs, where they prime T cells through the cell surface expression of MHC and costimulatory molecules and the secretion of immunoregulatory cytokines such as IL-12. Vγ9Vδ2 cells represent a major peripheral blood γδ T cell subset in humans (up to 1/20 of the peripheral blood lymphoid pool), which displays broad reactivity against microbial agents and tumors. They recognize both microbial metabolites [intermediates of the nonmevalonate (MVA) pathway of isoprenoid biosynthesis] and endogenous metabolites of the MVA pathway, such as isopentenyl pyrophosphate (IPP), for which production is upregulated upon cell stress (11). Alternatively, or additionally, IPP could be presented by surface receptors unrelated to the MVA pathway. In fact, IPP metabolites can be converted into triphosphoric acid 1-adenosin-5′-yl-ester-3-(3-methylbut-3-enyl)-ester, a recently described ATP analog, which could then be processed and presented at the cell surface. Similar to CD4 and CD8 T cells, Vγ9Vδ2 T lymphocytes are heterogeneous and comprise distinct populations that can be distinguished on the basis of surface marker expression and effector functions, such as cytokine secretion and cytotoxicity. Naive (Tnaive) CD45RA+CD27+ and central memory (TCM) CD45RA−CD27+ cells express lymph node homing receptors, abound in lymph nodes, and lack immediate effector functions. Conversely, effector memory (TEM) CD45RA−CD27− and terminally differentiated (TEMRA) CD45RA+CD27− cells express receptors for migration to inflamed tissues and are poorly represented in the lymph nodes while abounding at sites of inflammation, where they display immediate effector functions (cytokine production and cytotoxicity, respectively) (12). Participation in early immunity against M. tuberculosis is also a feature of γδ T cells, because they exert important biological functions such as production of cytokines (IFN-γ and TNF-α) and chemokines, prompt cytotoxicity, or modulate other cells involved (13). Although some reports showed the existence of a striking link between both of these cell subsets in vivo (14–17), the exact role of DCs in the activation of Vγ9Vδ2 T cells, particularly during M. tuberculosis infection, has not been clarified. Evidence from mouse and human studies suggests that γδ T cells may participate in adaptive immune responses acting on DC functions. Because the microenvironment is crucial to address the immune response toward beneficial or detrimental effect, we investigated the close modulatory relationships between Vγ9Vδ2 T cells and DCs during mycobacterial infection. PBMCs were isolated from buffy coats of healthy donors obtained from the Blood Bank of the University Hospital “P. Giaccone,” Palermo, Italy. Additionally, peripheral blood was obtained from 21 adult patients with tuberculosis (TB) disease (11 men, 10 women, age range 46–55 y) from the Dipartimento di Medicina Clinica e delle Patologie Emergenti, University Hospital, Palermo, Italy, and from 35 healthy controls (20 men, 15 women, age range 38–52 y). Patients with TB had clinical and radiological findings consistent with active pulmonary TB (18). Diagnosis was confirmed by bacteriological isolation of M. tuberculosis in 18 out of 21 patients. Three further patients were classified as having highly probable pulmonary TB on the basis of clinical and radiological features that were highly suggestive of TB and unlikely to be caused by any other disease; the decision was made by the attending physician to initiate anti-TB chemotherapy, which resulted in an appropriate response to therapy. All patients were treated in accordance with Italian guidelines and received therapy for 6 mo. Treatment was successful in all participants as evidenced by no clinical or radiographic evidence of current disease and sterile mycobacterial cultures. Peripheral blood was collected pre- (TB-0) and 4 mo postcompletion of antimycobacterial chemotherapy (TB-4). None of the patients with TB and control subjects had been vaccinated with bacillus Calmette-Guérin (BCG), had evidence of HIV infection, or was being treated with steroid or other immunosuppressive or antitubercular drugs at the time of their sampling. The study was approved by the Ethical Committee of the Dipartimento di Medicina Clinica e delle Patologie Emergenti, University Hospital, where the patients were recruited. Informed consent was given by all participants. CD14+ monocytes were obtained by PBMCs using MACS (Miltenyi Biotec, Bergisch Gladbach, Germany), according to the manufacturer’s instructions. The cells were then resuspended in RPMI 1640 (Euroclone, Devon, U.K.) supplemented with 10% FCS (Hyclone, Invitrogen, Italy), l-glutamine (2 mM), HEPES buffer (10 mM), and gentamycin (10 μg/ml) (Sigma-Aldrich, Munich, Germany) and cultured for 5 to 6 d in the presence of GM-CSF (25 ng/ml) and IL-4 (1000 U/ml) (Euroclone) to generate immature DCs. The resulting cell preparations routinely contained >90% of immature DCs as assessed by flow cytometry analysis. For induction of maturation, cultures of monocyte-derived DCs were supplemented with 1 μg/ml LPS (Sigma-Aldrich) for 24 or 48 h. Phenotype of DCs was routinely checked by analysis of upregulation of surface markers such as CD80, CD86, CD40, and MHC class II. DC functional status was confirmed by MLR assays using Tnaive populations (not shown). In experiments shown in Fig. 4, DCs were incubated for 24 h in the presence of zoledronate (Zol, 10 μM final concentration, kindly provided by Novartis Pharma, Origgio, Italy) preculture with LPS. For mycobacterial infection, DCs were infected for 24 h at 37°C, 5% CO2 with single-cell suspensions of M. tuberculosis H37Rv strain at a multiplicity of infection (MOI) of 10. In some experiments, DCs were infected with M. tuberculosis H37Rv that had been previously heat-inactivated by incubating it at 80°C for 60 min. The infection was carried out in the absence of antibiotics, and posttreatment, cells were washed with PBS to eliminate extracellular bacteria. Viability of infected cells was determined by trypan blue exclusion. In some experiments, DCs were preincubated with mevastatin (Sigma-Aldrich; 2.5 mM final concentration) preinfection with M. tuberculosis. γδ T cells were separated from allogeneic PBMCs by positive selection using anti-γδ magnetic beads (Miltenyi Biotec) according to the manufacturer’s instructions. Purified cell populations contained >98% of viable Vγ9Vδ2 T cells as assessed by flow cytometry. In some experiments, polyclonal Vγ9Vδ2 T cell lines obtained by prolonged Ag stimulation in vitro (19, 20) were used as a positive control. Vγ9Vδ2 T cells were labeled with CFSE (Molecular Probes, Eugene, OR), and 1 × 106 Vγ9Vδ2 T cells were cocultured with 1 × 106 uninfected or M. tuberculosis-infected DCs or with DCs that had been pulsed with Zol and matured with LPS in 24-well plates (Costar, Cambridge, MA) for 6 d at 37°C, 5% CO2. In some experiments, cocultures were carried out in the presence of blocking mAbs to TCR-γδ, NKG2D, MICA/B, ICOS-L, OX40, CD40L, CD80, CD86, ICAM-1, MHC class I, IL-15, or isotype-matched mAbs (all purchased from BD Biosciences, Mountain View, CA; 10 μg/ml final concentrations). To study cell-contact requirement, T lymphocytes were physically separated from DCs by a semipermeable membrane using transwell plates (6.5-mm diameter, 0.4-μm pore size; Corning Glass Work, Corning, NY). Vγ9Vδ2 T cells on the lower well were harvested after 6 d at 37°C by gentle pipetting in PBS, washed, resuspended in medium, and used for further analysis. In some experiments, cocultures of Vγ9Vδ2 T cells and M. tuberculosis-infected DCs were carried out in the presence of IL-15 (Euroclone; 10 nM final concentration). The following Abs were used: anti-CD80, anti-CD86, anti-CD40, anti–HLA-DR, anti–IFN-γ, anti–TNF-α, anti-CD27 and anti-CD45RA, labeled with different fluorochromes, all purchased from BD Biosciences, following the manufacturer’s recommendations. Vγ9Vδ2 T cell proliferation was assessed after 6 d of coculture according to loss of CFSE labeling in propidium iodide-negative cells (21). To study intracellular IFN-γ and TNF-α, Vγ9Vδ2 T cells were cocultured with uninfected or M. tuberculosis-infected DCs in the presence of monensin for the last 5 h at 37°C in 5% CO2. The cells were harvested, washed twice in PBS with 1% FCS, and fixed with PBS containing 4% paraformaldehyde overnight at 4°C. Fixation was followed by permeabilization with PBS containing 1% FCS, 0.3% saponin, and 0.1% Na azide for 15 min at 4°C. Staining of intracellular cytokines was performed by incubation of fixed permeabilized cells with FITC-labeled anti–IFN-γ and allophycocyanin-labeled anti–TNF-α mAb. After two more washes in PBS containing 1% FCS, the cells were analyzed by an FACSCalibur flow cytometer (BD Biosciences). Viable lymphocytes were gated by forward and side scatter, and analysis was performed on 100,000 acquired events for each sample. The results were analyzed using CellQuest software (CellQuest, Tampa, FL). Human monocytic THP-1 cells were labeled with CFSE and were infected with M. tuberculosis as described above. Infected or uninfected THP-1 cells were extensively washed and added to Vγ9Vδ2 T cells that had been previously cocultured for 6 d with M. tuberculosis-infected DCs. After 8 h of coculture, CFSE signaling was assessed by flow cytometry (17). Cocultures of M. tuberculosis-infected THP-1 cells and macrophages and Vγ9Vδ2 T cells were incubated for 20 h at 37°C as described above, washed three times to eliminate bacteria that were not cell associated, lysed with 0.1% saponin, and sonicated for 20 s. Serial 10-fold dilutions were made in 7H9 broth and plated on 7H10 agar plates. Plates were sealed in plastic, kept at 37°C, and the number of colonies (CFUs) was counted after 14–21 d (19, 20). Twenty-seven cytokines’ (IL-1β, IL-1R antagonist, IL-2, IL-5, IL-6, IL-7, IL-9, IL-12, IL-17, TNF-α, IL-4, IL-10, IL-13, IL-15, eotaxin, fibroblast growth factor-β, IFN-γ-inducible protein-10, IL-8, MIP-1α, MIP-1β, MCP-1, G-CSF, GM-CSF, IFN-γ, platelet-derived growth factor, RANTES, vascular endothelial growth factor) levels in sera from healthy contact (HC) subjects or patients with TB and in supernatants of uninfected and M. tuberculosis-infected DCs were evaluated by xMAP multiplex technology on the Luminex platform (Luminex, Austin, TX), using Bio-Rad reagents (Bio-Rad, Hercules, CA) acquired and analyzed with the Bioplex Manager Software (Bio-Rad). Responses were scored positive if the value was 2-fold over the negative control. Briefly, 50 μl bead solution (containing assay buffer and 5000 beads) was added to the appropriate wells in a 96-well Millipore filter plate (Millipore, Bedford, MA). Fifty microliters assay buffer was added to each background well: 50 μl diluted standard serum pool, diluted 2-fold from 1:25 to 1:3200 to each standard well and 50 μl diluted positive serum control, diluted 1:25 to each positive control well. Fifty microliters sample, diluted to 1:25 and 1:400, respectively, was added to each sample well. Standards and positive controls were diluted in assay buffer, and samples were diluted in assay buffer with 10% sample blocking buffer. After 30 min incubation at room temperature on a plate shaker and two washes, 50 μl biotinylated detection Ab, diluted 1:1000 in assay buffer with a final Ab concentration of 1.0 μg/ml, was added to each well. After further 30 min incubation at room temperature on a plate shaker and two washes, 50 μl diluted streptavidin–R-PE, diluted 1:250 in assay buffer, was added to each well. After further 30 min incubation at room temperature on a plate shaker and two washes, the samples were analyzed on the Luminex machinery (Luminex). The two-tailed Student t test was used to compare significance of differences between groups. Data from experiments in Fig. 5A were compared using one-way ANOVA with Kruskal-Wallis multiple comparison test using Instat software (version 3.05, GraphPad, San Diego, CA). Values of p < 0.05 were considered statistically significant. γδ T cells and DCs play an essential role in the initiation of immune response to M. tuberculosis, and previous studies in mouse models in vitro and in vivo have shown their ability to interact at early stage of immune response (14, 15). We investigated the effect of infection of a virulent M. tuberculosis H37Rv strain of human immature DCs in the presence or absence of Vγ9Vδ2 T cells. Immature DCs were generated from purified monocytes of healthy donors by culturing with GM-CSF and IL-4 for 5 d and were infected with live M. tuberculosis H37Rv at an MOI of 10. 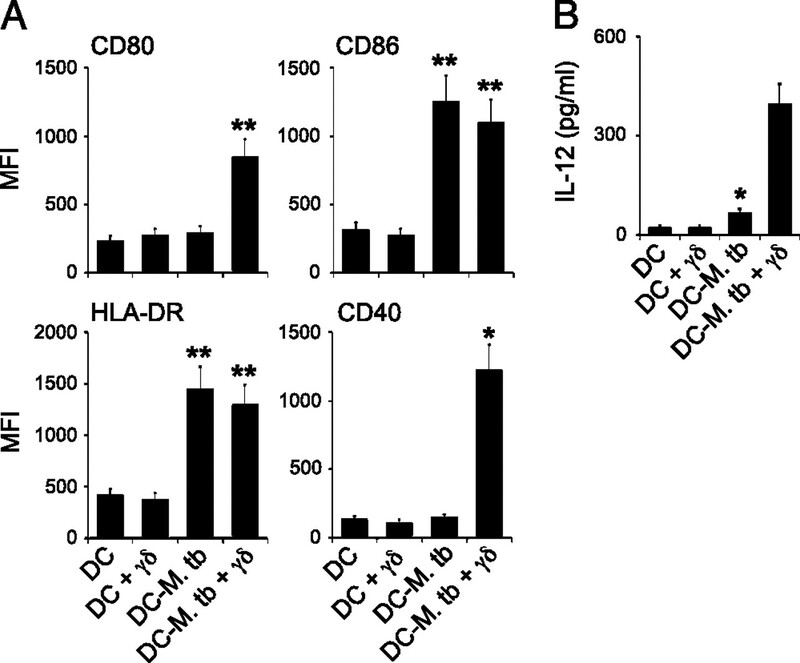 Postincubation in the presence or absence of γδ T cells, DCs were washed and analyzed for the expression of MHC class II (HLA-DR), CD80, CD86, and CD40. Cumulative data from eight individual experiments are shown in Fig. 1A. We observed that M. tuberculosis infection caused upregulation of CD86 and HLA-DR molecules, but not of CD80 and CD40. 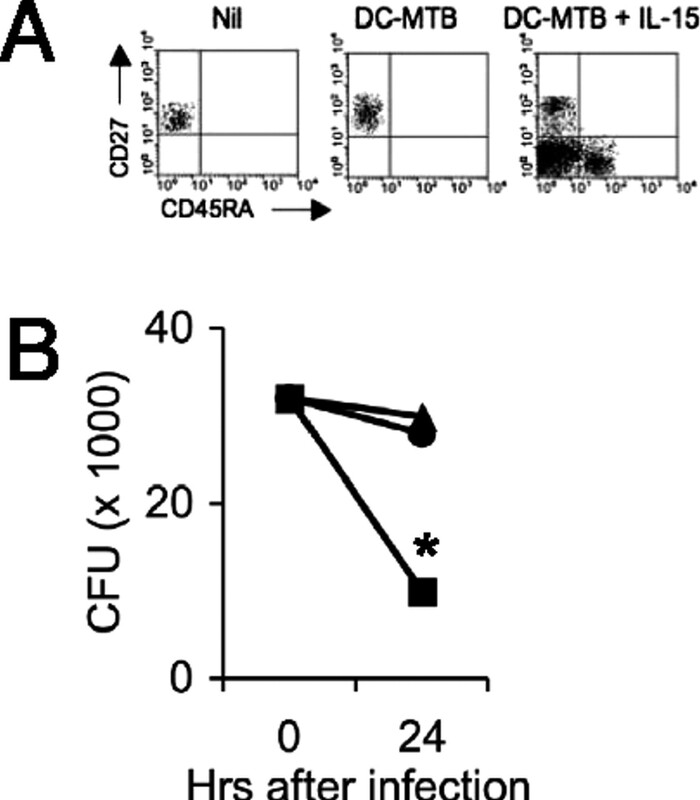 Coculture of M. tuberculosis-infected DCs with Vγ9Vδ2 T cells determined upregulation of CD80 and CD40 expression and no changes of HLA-DR and CD86 expression, suggesting that freshly isolated Vγ9Vδ2 T cells can modulate the expression of costimulatory molecules on M. tuberculosis-infected DCs. Additionally, and consistent with induction of full DC maturation by Vγ9Vδ2, a significant upregulation of IL-12p70 production was observed when M. tuberculosis-infected DCs were cocultured for 2 d with Vγ9Vδ2 T cells (62.5 pg/ml versus 394.7 pg/ml; Fig. 1B). Vγ9Vδ2 T cells potentiate the maturation of M. tuberculosis-infected DCs. Immature DCs were generated from purified monocytes of healthy donors by culturing with GM-CSF and IL-4 for 5 d, infected with live M. tuberculosis H37Rv at an MOI of 10, and cocultured with purified Vγ9Vδ2 T cells, as described in Materials and Methods. DC expression of MHC class II (HLA-DR), CD80, CD86, and CD40 was assessed by FACS analysis. A shows cumulative data of costimulatory molecules expression between M. tuberculosis-infected DCs in the absence or presence of Vγ9Vδ2 T cells. Results are expressed as mean fluorescence intensity. Data represent the average value of triplicate samples ± SD and are representative of eight independent experiments. 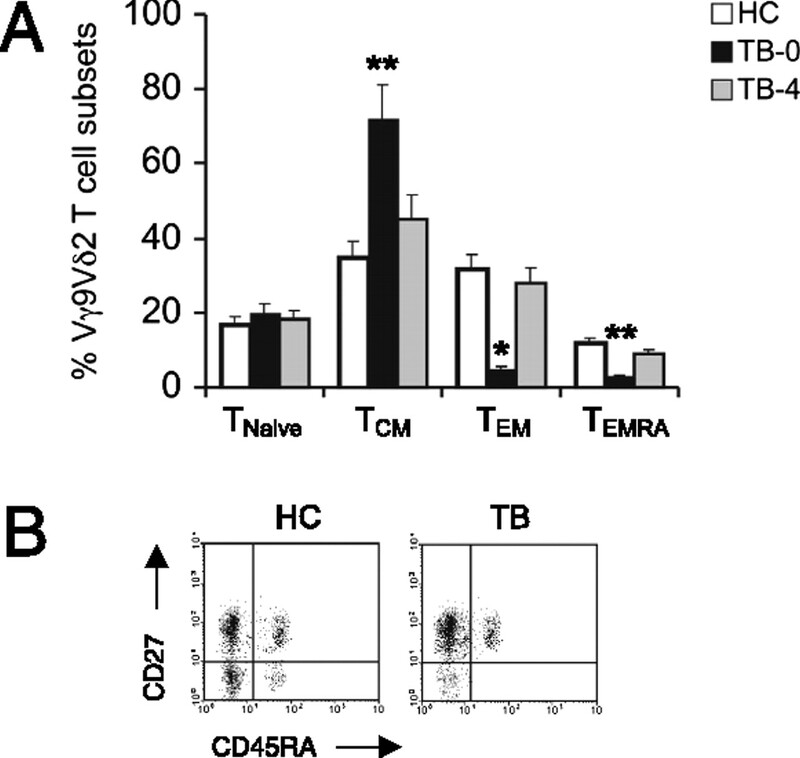 B, Vγ9Vδ2 T cells promote IL-12 production by M. tuberculosis-infected DCs. Uninfected or M. tuberculosis-infected DCs were cocultured with Vγ9Vδ2 T cells for 48 h, and supernatants were collected and tested for IL-12 by Luminex. Data represent the average value of triplicate samples ± SD and are representative of three independent experiments. *p < 0.001; **p < 0.01 when compared with the group consisting of DCs alone (i.e., cocultured with medium). To ascertain the influence of M. tuberculosis-infected DCs upon resting Vγ9Vδ2 T cells, M. tuberculosis-infected or uninfected DCs were cocultured with autologous or allogeneic purified, CFSE-labeled Vγ9Vδ2 T cells for 6 d. Cumulative data from 12 individual experiments are shown in Fig. 2A, and representative data are shown in Fig. 2B. M. tuberculosis-infected DCs induced substantial proliferation of either autologous or allogeneic Vγ9Vδ2 T cells (mean 78%), whereas uninfected DCs failed to induce proliferation (mean 1.58%). DCs infected with heat-killed M. tuberculosis did not induce proliferation of Vγ9Vδ2 T cells, indicating that an active infection is required. Moreover, Vγ9Vδ2 T cells required contact with M. tuberculosis-infected DCs to proliferate, because when the cells were cocultured separated by a transwell membrane to allow free exchange of soluble factors between upper and lower chambers in the absence of contact, Vγ9Vδ2 T cells consistently failed to proliferate (Fig. 2C). It has been previously reported that infections with low bacteria inocula upregulate the production and accumulation of host-derived intermediates of the MVA pathway, such as IPP, which in turn activate Vγ9Vδ2 T cells (22). To confirm or exclude this possibility, we treated M. tuberculosis-infected DCs with mevastatin, which is able to block the upstream enzyme 3-hydroxy-3-methylglutaryl-CoA reductase and consequently the production of endogenous IPP. M. tuberculosis-infected DCs pulsed with mevastatin were as able as untreated infected DCs to sustain efficient proliferation of Vγ9Vδ2 T cells, thus excluding involvement of the MVA pathway and endogenous phospho-Ags (Fig. 3A). Mechanisms of Vγ9Vδ2 T cell proliferation by M. tuberculosis-infected DCs. In A, CFSE-labeled Vγ9Vδ2 T cells were cocultured for 6 d in vitro with M. tuberculosis-infected DCs that had been treated or not with mevastatin or in the presence of the indicated blocking Abs, all used at the final concentration of 10 μg/ml. Data are mean ± SD of seven different experiments carried out in triplicate. B shows flow cytometry panels of a representative experiment. Numbers in B indicate the percentage of dividing cells. *p < 0.001 when compared with proliferation assays carried out in the absence of inhibitors. In previously published papers, many different membrane molecules have been implicated in DC-induced γδ T cell activation (16). However, blocking of costimulatory molecules expressed by DCs or Vγ9Vδ2 T cells, such as NKG2D, MICA/B, ICOS-L, OX40, CD40L, CD40, CD80, CD86, or Fas ligand by neutralizing Abs did not affect proliferation of Vγ9Vδ2 T cells, whereas addition to cultures of a blocking Ab to the γδ TCR significantly inhibited their proliferation (Fig. 3A). Fig. 3B shows representative results. Altogether, these results indicate that Vγ9Vδ2 T cell proliferation by M. tuberculosis-infected DCs does not require endogenous phospho-Ags or membrane-bound costimulatory molecules, but is dependent on a cell-to-cell contact between the reactive Vγ9Vδ2 TCR and a ligand expressed by infected DCs, most likely M. tuberculosis-derived phospho-Ags. To assess the differentiation pattern of Vγ9Vδ2 T cells expanded by M. tuberculosis-infected DCs, staining for CD45RA and CD27 was performed on Vγ9Vδ2 T cells after 6 d of coculture with M. tuberculosis-infected DCs. As expected, the majority of Vγ9Vδ2 T cells purified from buffy coats showed a TCM, but also consisted of cells with a TEM phenotype and few cells with Tnaive and TEMRA phenotype and, upon coculture with DCs that had been pulsed with Zol and matured with LPS, efficiently differentiated into TEM and TEMRA cell phenotypes. This process was strictly IL-15 dependent, as addition to cocultures of a blocking Ab to IL-15 significantly inhibited differentiation of Vγ9Vδ2 T toward an affector phenotype (Fig. 4A). Surprisingly, the vast majority of Vγ9Vδ2 T cells expanded by M. tuberculosis-infected DCs expressed a TCM phenotype (Fig. 4A) and they maintained this phenotype in coculture with M. tuberculosis-infected DCs for 12–15 d (data not shown). Moreover, intracellular FACS analysis showed that Vγ9Vδ2 that had been cocultured with M. tuberculosis-infected DCs did not express IFN-γ and TNF-α (not shown) upon in vitro short-term stimulation with IPP, thus confirming that they lack immediate effector functions (Fig. 4B). Finally, we investigated the cytotoxic activity of Vγ9Vδ2 T cells cocultured with M. tuberculosis-infected DCs against M. tuberculosis-infected THP-1 cells. As shown in Fig. 4C, Vγ9Vδ2 T cells derived from coculture with M. tuberculosis-infected DCs lacked any cytotoxic activity toward M. tuberculosis-infected THP-1 cells, which otherwise were efficiently killed by a cytotoxic Vγ9Vδ2 T cell line. Memory status and functional analysis of γδ T cells expanded by M. tuberculosis-infected DCs. Vγ9Vδ2 T cells were cocultured for 6 d of with uninfected DCs, M. tuberculosis-infected DCs, Zol- and LPS-treated DCs, or with Zol- and LPS-treated DCs in the presence of anti-IL-15 mAb. A shows staining for CD45RA and CD27 after gating on the Vδ2+ population. B shows intracellular FACS analysis of the IFN-γ content in Vγ9Vδ2 T cells upon in vitro short-term (6 h) stimulation with IPP. A representative experiment out of 15 is shown. The cluster of events shown in gray in the box corresponds to the responder Vδ2 T cells (i.e., Vδ2 T cells expressing IFN-γ), whereas the cluster of events in black corresponds to the nonresponder Vδ2 T cells. Numbers indicate the percentage of positive cells. C, Vγ9Vδ2 T cells that had been cocultured with uninfected or M. tuberculosis-infected DCs were cultured with M. tuberculosis-infected THP-1 cells, and cytotoxicity of these latter was evaluated as described in Materials and Methods. Data shown are the mean values of cytotoxicity ± SD from one representative experiment out of seven independent experiments performed. As a positive control of cytotoxicity, a Vγ9Vδ2 polyclonal T cell line was used. Altogether, these results indicate that M. tuberculosis-infected DCs trigger Vγ9Vδ2 T cell division with maintenance of a TCM phenotype, but are unable to promote long-term ex vivo differentiation of activated human Vγ9Vδ2 T cells into effector cells. The previously reported finding that M. tuberculosis-infected DCs though triggering Vγ9Vδ2 T cell proliferation maintain a central memory phenotype with failure to differentiation into effectors prompted us to compare the phenotype of circulating Vγ9Vδ2 T cell subsets in patients with TB and in HCs. Cumulative data are shown in Fig. 5A, and representative data are shown in Fig. 5B. In HCs, the majority of Vγ9Vδ2 T cells had a TCM and TEM phenotype, 17% had a Tnaive phenotype, and <15% had a TEMRA phenotype. In patients with TB pretherapy (TB-0), the mean percentage of naive cells was comparable to that in HCs, but Vγ9Vδ2 T cells from patients with TB contained higher proportions of cells with a TCM phenotype (72% in patients with TB versus 35% in HCs); however, patients with TB also had significantly reduced frequencies of Vγ9Vδ2 T cells with a TEM (5% in patients with TB versus 32% in HCs) and TEMRA (3% in patients with TB versus 12% in HCs) phenotype, and differences between patients with TB and HC subjects attained statistic significance. In patients with TB at 4 mo postcompletion of therapy (TB-4), the mean frequencies of Vγ9Vδ2 T cell subsets with TCM, TEM, and TEMRA phenotypes were found to be comparable to those observed in HCs, differing significantly from frequencies found in TB-0 patients. Phenotype of circulating Vγ9Vδ2 T cells in patients with TB and in HCs. PBMCs from HCs and patients with TB pre- (TB-0) and postcompletion of chemotherapy (TB-4) were stained with anti-Vδ2, anti-CD27, and anti-CD45RA mAbs, and percentages of Tnaive (CD45RA+CD27+), TCM (CD45RA−CD27+), TEM (CD45RA−CD27−), and TEMRA (CD45RA+CD27−) cells were determined by FACS analysis. A shows cumulative data from 21 patients with TB and 35 HCs, whereas B shows representative flow cytometry panels from a patient with TB and an HC. *p < 0.005; **p < 0.01 when compared with values in HCs. Thus, the data reported in this study suggest that the pool of Vγ9Vδ2 T cells with immediate effector functions (effector-memory and terminally differentiated cells) is consistently reduced in patients with TB, despite an expansion of Vγ9Vδ2 T cells with a central memory phenotype, but this pattern reverses after antimycobacterial therapy. The finding that the Vγ9Vδ2 T cell response to M. tuberculosis-infected DCs in vitro and in patients with TB in vivo is largely predominated by the central memory subset prompted us to search for a possible mechanism responsible for this polarized response. Because differentiation of central memory Vγ9Vδ2 T cells into effector memory cells requires IL-15 (23), in addition to Ag stimulation, failure of M. tuberculosis-infected DCs to induce efficient differentiation of TEM and TEMRA subsets of Vγ9Vδ2 T cells could be explained by the lack of production of this relevant cytokine. Related to this, a set of cytokine analyses of M. tuberculosis-infected DCs was undertaken using the Luminex platform (Luminex). The study confirmed that many different cytokines (including IL-1β, IL-6, IL-10, IL-12, IL-23, and TNF-α) were abundantly secreted by M. tuberculosis-infected DCs at amounts similar or even higher than those detected upon stimulation with LPS, but additionally found that DCs did not produce IL-15 during M. tuberculosis infection in vitro (Fig. 6A), even when cocultured with Vγ9Vδ2 T cells (Fig. 6B). Moreover, in vitro infection with M. tuberculosis reduces the capability of DC to produce IL-15 upon LPS stimulation, thus indicating that M. tuberculosis actively inhibits, rather than simply not inducing, IL-15 secretion (Fig. 6B). 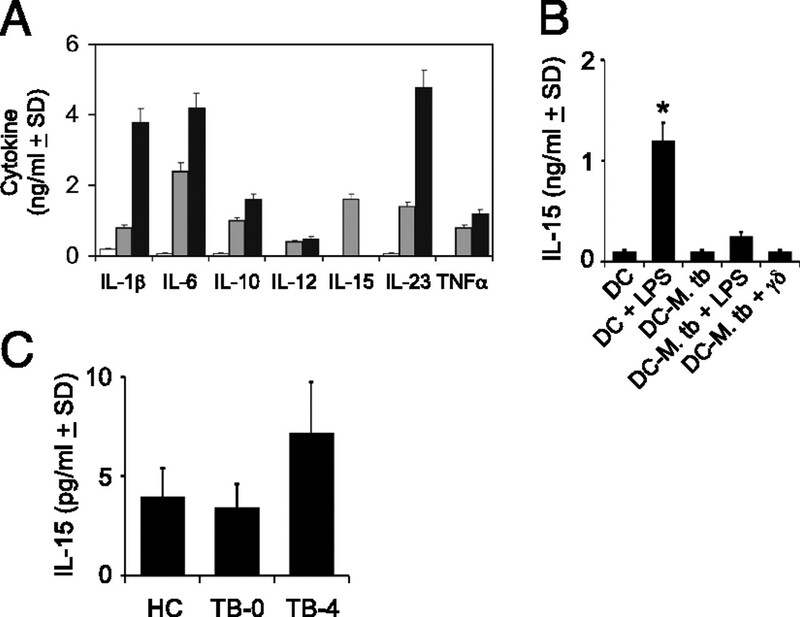 IL-15 production by M. tuberculosis-infected DCs in vitro and during active tuberculosis in vivo. A shows cytokine (IL-1β, IL-6, IL-10, IL-12, IL-15, IL-23, and TNF-α) production by uninfected (white columns), M. tuberculosis-infected (black columns), or LPS-stimulated (gray columns) DCs, as assessed using the Luminex Platform. B shows IL-15 production by DCs in different culture conditions. C shows IL-15 serum levels in HCs and patients with TB pre- (TB-0) and postcompletion of chemotherapy (TB-4). *p < 0.001 as compared with all other groups. The finding that M. tuberculosis actively inhibits in vitro IL-15 production by infected DCs prompted us to compare IL-15 serum levels in patients with TB and in HCs. No significant differences were found between the serum levels of IL-15 in HCs and patients with TB pretreatment (Fig. 6C). Generally, very low to undetectable (in some subjects) levels of IL-15 were found in both groups. IL-15 serum levels increased by 2-fold in TB-4 patients, but the differences with values detected at TB-0 did not reach statistical significance. This finding indicates that IL-15 production is not induced in patients with active TB but increases postcompletion of chemotherapy. Because IL-15 plays a crucial role in the differentiation pathway of central memory Vγ9Vδ2 T cells into effector cells (23), we cocultured Vγ9Vδ2 T cells and M. tuberculosis-infected DCs in the presence of IL-15. Results show that in the presence of IL-15, Vγ9Vδ2 T cells efficiently differentiated into both TEM and TEMRA cells (Fig. 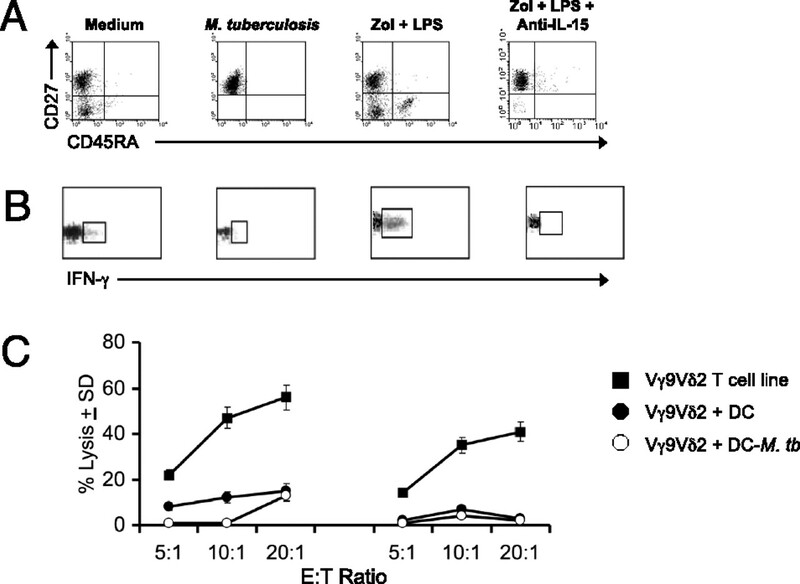 7A), which displayed potent antimycobacterial function, as demonstrated by the capability of the expanded population of Vγ9Vδ2 T cells to reduce the viability of intracellular M. tuberculosis (Fig. 7B). IL-15 restores differentiation of Vγ9Vδ2 T cells. In A, cocultures of M. tuberculosis-infected DCs and Vγ9Vδ2 T cells were carried out for 6 d in the presence of IL-15. At the end of the culture period, the percentages of Tnaive (CD45RA+CD27+), TCM (CD45RA−CD27+), TEM (CD45RA−CD27−), and TEMRA (CD45RA+CD27−) cells were determined by FACS analysis. B, Vγ9Vδ2 T cells that had been cocultured with uninfected DCs (triangles), M. tuberculosis-infected DCs (circles), or M. tuberculosis-infected DCs and IL-15 (squares) were incubated with M. tuberculosis-infected THP-1 cells for 24 h and CFU counts determined as described in Materials and Methods. *p < 0.01 when compared with Vγ9Vδ2 T cells cocultured with uninfected- or M. tuberculosis-infected DCs. Collectively, these results indicate that the lack of IL-15 production by M. tuberculosis-infected DCs is causative of the incomplete phenotypical and functional differentiation of effector Vγ9Vδ2 T cells. M. tuberculosis enters the host typically via aerosols, and alveolar macrophages are considered the first cells to engulf M. tuberculosis and become infected. However, DCs have been identified in the airway mucosal, in particular at submucosal and interstitial sites of the respiratory tract (20). Hence, DCs could directly capture M. tuberculosis and then transport the pathogen from the primary site of bacterial implantation to the draining lymph node. There, DCs can present mycobacterial Ags to T lymphocytes and in this way induce the protective T cell response (4, 7, 24–26). Although IFN-γ–producing CD4 T cells of the Th1 type are of major importance, other T cells, notably CD8, γδ, and CD1-restricted αβ T cells, participate as well (27). The major protective function is macrophage activation by IFN-γ, and hence protection is a typical Th1 phenomenon. In addition, mycobacterial killing by cytotoxic T cells, which release a lethal combination of perforin and granulysin, could contribute to protection (28). Although infection with BCG has been reported to induce maturation of DCs, in vitro infection of human DCs by M. tuberculosis has also shown to impair their maturation, reduce their secretion of IL-12, and inhibit their ability to stimulate T cell proliferation (29–31). Moreover, recent in vivo experiments demonstrated that M. tuberculosis targets DC migration and Ag presentation to promote persistent infection in mice (32). These findings suggest that M. tuberculosis can interfere with the host immune response by hampering several functions of DCs. Studies in human models in vitro and in murine models in vivo have demonstrated that γδ T cells also participate in early immune responses against M. tuberculosis (14, 15). However, in a more physiological situation, such as during infection by a Vγ9Vδ2-stimulating pathogen unable to promote complete DC maturation, it is easy to hypothesize that many different stimuli, besides microbial-derived phospho-Ags, may influence the activation state of DCs and Vγ9Vδ2 T cells. Accordingly, we show in this study that Vγ9Vδ2 induces full maturation of M. tuberculosis-infected immature DCs that were otherwise unable to complete maturation. These in vitro results, which strongly suggest that Vγ9Vδ2 T cells act as adjuvants of the antimycobacterial response in vivo, are clearly in line with recent studies demonstrating IFN-γ–dependent priming of conventional tumor-specific Th1 responses (38) or M. tuberculosis-specific CD8 T cell response by murine γδ T cell subsets. Reciprocally, we demonstrate in this study that, M. tuberculosis-infected DCs lead to a rapid and strong activation of cocultured Vγ9Vδ2 T cells without requirement for any additional stimulation. The M. tuberculosis-infected DC-mediated potentiation of Vγ9Vδ2 T cell responses could be explained at least in part by upregulation and/or presentation of M. tuberculosis-derived phospho-Ags to Vγ9Vδ2 T cells. In fact, both transwell experiments and blocking studies suggest primary involvement of membrane-bound stimuli. The possible implication of several candidate costimulatory molecules differentially expressed by DCs (such as NKG2D, MICA/B, ICOS-L, OX40, and CD40L) was studied by means of blocking reagents, but did not led to any conclusive results to date. Analysis of the effect of inhibitors of various signaling cascades as well as transcriptome analysis of maturing DCs at various time points after Vγ9Vδ2 incubation should certainly help identify the mechanisms underlying such a potentiation effect. Surprisingly, and in contrast with previously published findings, M. tuberculosis-infected DCs selectively induced proliferative, but not cytokine or cytolytic, responses of Vγ9Vδ2 T cells, and this was associated to the expansion of phenotypically immature, central memory-type Vγ9Vδ2 T cells. Importantly, such functional and phenotypic properties can be presently documented in the context of a natural infection, as demonstrated by the consistent expansion of Vγ9Vδ2 T cells with a TCM phenotype in the peripheral blood of patients with active TB, which was accompanied by the dramatic reduction of the pool of Vγ9Vδ2 T cells with immediate effector functions (TEM and TEMRA cells). However, this skewed representation of circulating Vγ9Vδ2 T cell phenotypes during active TB was transient and completely reversed after successful antimycobacterial therapy. This explains previous findings from our group showing that Vγ9Vδ2 T cells from children affected by active TB have an increased proliferative activity, but decreased IFN-γ production and granulysin expression (39). After successful chemotherapy, the Vγ9Vδ2 T cell proliferative response strongly decreased, whereas IFN-γ and granulysin production consistently increased (39). A possible explanation for the incomplete phenotypic and functional differentiation of Vγ9Vδ2 T cells could be explained by the lack of relevant cytokine secreted by M. tuberculosis-infected DCs. In fact, it has been previously shown (23) that differentiation of Vγ9Vδ2 TCM cells into TEM and TEMRA cells occurs upon Ag stimulation in the presence of IL-15, whereas any other tested cytokine, including IL-7, had no such effect. The main effect of IL-15 in the pathway leading to differentiation of Vγ9Vδ2 T cells toward effector memory cells was associated with resistance to cell death and Bcl-2 expression (23). Related to this, a set of cytokine analyses of DCs infected with M. tuberculosis showed that they produced many different cytokines, but not IL-15. However, lack of IL-15 production was not due to the fact that M. tuberculosis simply does not induce synthesis of this cytokine; rather, it actively inhibits IL-15 secretion. Additionally, and similar to the in vitro data, analyses of IL-15 serum levels in HCs and patients with TB showed that IL-15 production is not induced in patients with active TB, but increases postcompletion of chemotherapy. Altogether, these findings strongly support the view that the lack of IL-15 could be associated to the immature phenotypical differentiation in our model. Indeed, adding IL-15 to cocultures of M. tuberculosis-infected DCs and Vγ9Vδ2 caused efficient differentiation of Vγ9Vδ2 T cells with maintenance of the central memory pool and generation of effector-memory and terminally differentiated effector memory cells, which displayed potent antimycobacterial function, as demonstrated by their ability to efficiently reduce the viability of intracellular M. tuberculosis. We therefore conclude that M. tuberculosis-infected DCs stimulate selective proliferation, but not cytokine or cytolytic responses of Vγ9Vδ2 T cells, and expand a specific central-memory Vγ9Vδ2 T cell population that lacks immediate effector functions. As such, the response of Vγ9Vδ2 T cells during M. tuberculosis infection is abortive and should not contribute to protection. Moreover, the finding that such an abortive Vγ9Vδ2 T cells response is most likely due to the lack of IL-15 production by the infected DCs represents an additional strategy that M. tuberculosis exploits to escape immune response at the stage of innate immunity and reveals another level of plasticity in tailoring adaptive immunity to pathogens. We thank Kris Huygen for the generous gift of M. tuberculosis H37Rv strain and Marc Bonneville, Emmanuel Scotet, and Jean Jacques Fournié for helpful suggestions and criticism. This work was supported by grants from the European Commission within the 6th Framework Programme, TB-VAC Contract Number LSHP-CT-2003-503367, the Italian Ministry for Instruction, University, and Research (MIUR-PRIN; to F.D. ), and the University of Palermo (60%).
. 2005. Dendritic cell maturation by innate lymphocytes: coordinated stimulation of innate and adaptive immunity. J. Exp. Med. 202: 203–207.
. 2000. IL-10 converts human dendritic cells into macrophage-like cells with increased antibacterial activity against virulent Mycobacterium tuberculosis. J. Immunol. 165: 978–987.
. 2000. Mycobacterium tuberculosis-activated dendritic cells induce protective immunity in mice. Immunology 99: 473–480.
. 1997. Activation of human dendritic cells following infection with Mycobacterium tuberculosis. J. Immunol. 159: 635–643.
. 2000. Interaction of dendritic cells with mycobacteria: where the action starts. Immunol. Cell Biol. 78: 318–324.
. 2000. Interaction of Mycobacterium avium with human monocyte-derived dendritic cells. Infect. Immun. 68: 5824–5829.
. 1986. Dendritic cells with antigen-presenting capability reside in airway epithelium, lung parenchyma, and visceral pleura. J. Exp. Med. 163: 436–451.
. 1987. Localization of T cells, macrophages, and dendritic cells in rat respiratory tract tissue: implications for immune functions studies. Immunology 62: 349–356.
. 1994. Dendritic cells and their precursors isolated from human bronchoalveolar lavage: immunocytologic and functional properties. Am. J. Respir. Cell Mol. Biol. 11: 344–350.
. 1998. Role of γ δ T lymphocytes in immune response in humans and mice. Crit. Rev. Immunol. 18: 327–357.
. 2003. Characterization of lung γ δ T cells following intranasal infection with Mycobacterium bovis bacillus Calmette-Guérin. J. Immunol. 170: 463–469.
. 2004. Reciprocal stimulation of gammadelta T cells and dendritic cells during the anti-mycobacterial immune response. Eur. J. Immunol. 34: 3227–3235.
. 2006. gammadelta T cells condition dendritic cells in vivo for priming pulmonary CD8 T cell responses against Mycobacterium tuberculosis. Eur. J. Immunol. 36: 2681–2690.
. 2005. Reciprocal activating interaction between dendritic cells and pamidronate-stimulated gammadelta T cells: role of CD86 and inflammatory cytokines. J. Immunol. 174: 252–260. Diagnostic standards and classification of tuberculosis in adults and children. This official statement of the American Thoracic Society and the Centers for Disease Control and Prevention was adopted by the ATS Board of Directors, July 1999. This statement was endorsed by the Council of the Infectious Disease Society of America, September 1999. 2000. Am. J. Respir. Crit. Care Med. 161: 1376–1395.
. 2007. Targeting human γδ T cells with zoledronate and interleukin-2 for immunotherapy of hormone-refractory prostate cancer. Cancer Res. 67: 7450–7457.
. 2009. The cellular and biochemical rules of lipid antigen presentation. Eur. J. Immunol. 39: 2648–2656.
. 2005. Differential requirements for antigen or homeostatic cytokines for proliferation and differentiation of human Vgamma9Vdelta2 naive, memory and effector T cell subsets. Eur. J. Immunol. 35: 1764–1772.
. 2002. Constitutive and induced expression of DC-SIGN on dendritic cell and macrophage subpopulations in situ and in vitro. J. Leukoc. Biol. 71: 445–457.
. 2004. Dendritic cell trafficking and antigen presentation in the human immune response to Mycobacterium tuberculosis. J. Immunol. 173: 494–506. 2000. Role of chemokines in trafficking of lymphocytes and dendritic cells. Int. J. Hematol. 72: 399–407.
. 1999. Confrontation between intracellular bacteria and the immune system. Adv. Immunol. 71: 267–377.
. 1999. T cell mediated immunity to Mycobacterium tuberculosis. Curr. Opin. Microbiol. 2: 89–93.
. 2007. Intermediate maturation of Mycobacterium tuberculosis LAM-activated human dendritic cells. Cell. Microbiol. 9: 1412–1425.
. 2003. Mycobacterium tuberculosis inhibits maturation of human monocyte-derived dendritic cells in vitro. J. Infect. Dis. 188: 257–266.
. 2007. Mycobacterium tuberculosis heat-shock protein 70 impairs maturation of dendritic cells from bone marrow precursors, induces interleukin-10 production and inhibits T-cell proliferation in vitro. Immunology 121: 462–472.
. 2007. Mycobacterium tuberculosis infects dendritic cells with high frequency and impairs their function in vivo. J. Immunol. 179: 2509–2519.
. 1989. 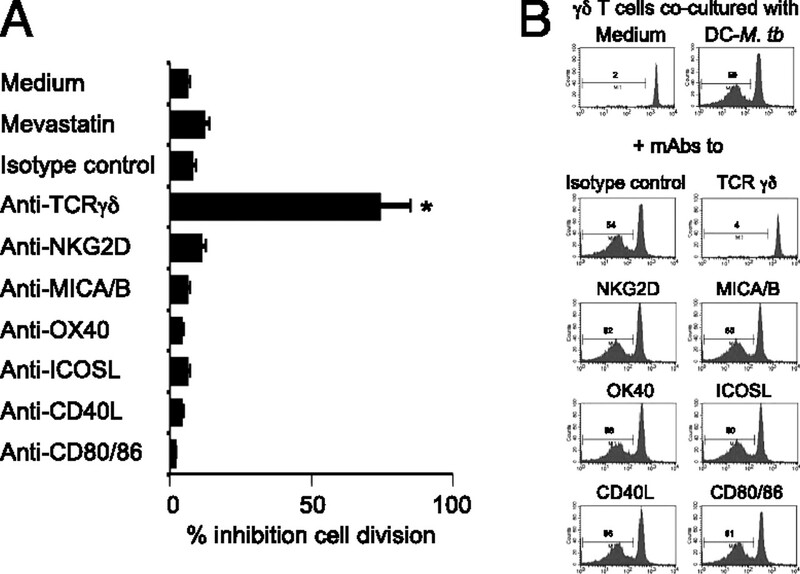 Activation of γ δ T cells in the primary immune response to Mycobacterium tuberculosis. Science 244: 713–716. 1999. Gammadelta T cells and Mycobacterium tuberculosis. Microbes Infect. 1: 187–195.
. 2004. Gammadelta T cells in immunity induced by Mycobacterium bovis bacillus Calmette-Guérin vaccination. Infect. Immun. 72: 1504–1511.
. 2002. Human γ δ T cells induce dendritic cell maturation. Clin. Immunol. 103: 296–302.
. 2002. CD1-mediated gamma/delta T cell maturation of dendritic cells. J. Exp. Med. 196: 1575–1584.
. 2003. Gamma delta T cells provide an early source of interferon gamma in tumor immunity. J. Exp. Med. 198: 433–442.
. 2002. Selective depression of interferon-γ and granulysin production with increase of proliferative response by Vgamma9/Vdelta2 T cells in children with tuberculosis. J. Infect. Dis. 186: 1835–1839.